Tours de Sport Hot Deals: Ski $$ Go Further in Canada! Whistler 4 night stays from $585 per person! Ski $$ Go Further in Canada! 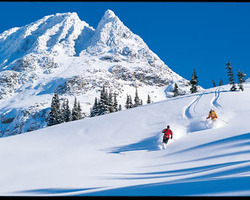 Whistler 4 night stays from $585 per person! Big Savings on 4 night stays in Whistler Blackcomb when you book by February 19th! Painted Cliff offers true ski-in ski-out access to Blackcomb Mountain during the winter season. These slopeside townhomes are situated next to Blackcomb's Lower Cruiser run, and offer convenient ski-out access to Blackcomb Mountain's Wizard Chair. High in Blackcomb's Benchlands, many feature beautiful mountain and valley views. The spacious and beautifully decorated townhomes offer lovely living areas with a stone-faced wood fireplace. After a long day of skiing, visit the common area hot tub to start a relaxing evening! 4 NIGHTS/3 DAYS from $585 USD person!!! Compared to $705 per person during the 2014-2015 season! You can also go directly to the Whistler Blackcomb Ski Vacation page to start your custom trip quote for Whistler Blackcomb.